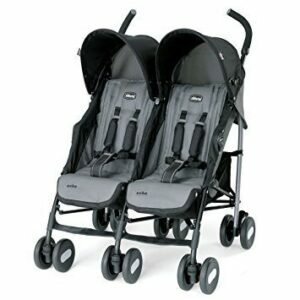 There are loads of twin strollers available on the market, each with different features and accessories. There is a huge range in price between different models too, so we have compiled this list of our favorite picks from different brands, at a variety of price points to suit all budgets. The strollers here are best suited to twins. If you are looking for a stroller for your infant and toddler, then we also have some others in our stroller for babies section. 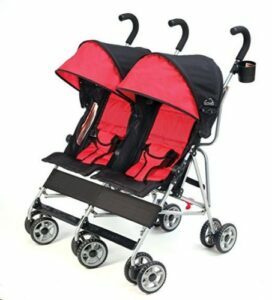 Choosing a twin stroller to suit your needs can be difficult and time-consuming. Here are a few things to bear in mind when shopping for the perfect stroller for your twins. Age – Some umbrella strollers are not suitable for newborns. Make sure to check the stroller is suitable for your children, to ensure they have a safe and comfortable ride. Size – If you plan to take the stroller in the trunk of your car, it’s wise to check the dimensions first. Umbrella strollers tend to fold to a smaller size than other strollers, meaning they are often a better choice for those with smaller vehicles. Also, some strollers can be heavy so make sure you will be able to lift it by yourself if this will be necessary. Extra Features – Check whether the stroller comes with any additional accessories you require. Sometimes, they are available to purchase separately, so make sure any accessories you wish to buy are compatible with your stroller. This stylish teal stroller is suitable for babies from birth to 50 pounds. This means it will be the only stroller you’ll ever need for your twins. The stroller itself weighs around 25 pounds, making it easy to handle and carry – perfect for solo outings with the twins. The stroller can stand itself when folded and has a handy carry strap for when you’ve got your hands full. For sunny days, the stroller comes with two UPF 50 canopies to keep your kids safe, whilst also offering a window for you to keep an eye on them. There are integrated cup holders and storage pockets so parents can keep all their important things to hand. 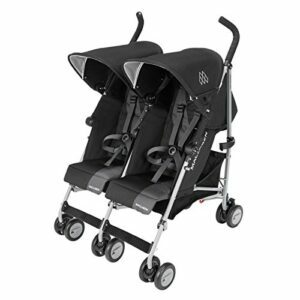 This Maclaren twin stroller is great quality, yet weighs in at only 21 pounds. It can be used by children over the age of 6 months and can hold up to 110 pounds overall. There are a strong wind and rain-proof cover included with this stroller. The suspension on this side-by-side stroller is great and will ensure your kids remain comfortable as they grow. The seat offers a variety of recline positions, so your children can have a nap when you’re out and about. The reclining seats also make it comfortable and supportive for younger babies. The 5-point safety harness is great to keep young babies securely strapped in, too. 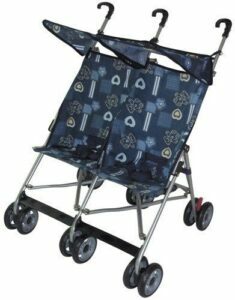 There are accessories available to go with this stroller, including a cup holder and a parental organizer. This great value tandem stroller is ideal for twins from birth up to around 3 or 4 years old, or weighing 35 pounds each. There isn’t a storage basket underneath, but there are large hanging bags at the back of the seats, as well as a cup holder for parents. The seats recline independently to ensure your children can sit comfortably no matter how old they are. Each canopy can also move separately to accommodate two different sized children. The stroller is great for taking in the car – it weighs only 18 pounds making it easy to lift in and out even with all the bags you need for twins. The stroller can also fit through a standard 30-inch doorway. This lightweight, budget tandem stroller comes with everything you would expect from a more expensive model. Coming in at just over 20 pounds, it’s great for portability. Each of the seats and canopies can move independently, to ensure both children remain comfortable as they grow. The seat backs of this side-by-side stroller can roll up or down, to reveal a mesh backing. This gives your children more air during the warm summer weather, keeping them comfortable and cool. The stroller can hold up to 70 pounds total, making it perfect for older toddlers to use too. The folded size is very compact, making it easy to store or to take in the car. This is the ideal tandem stroller for those on a budget. It comes in a variety of colors to suit either boys or girls. 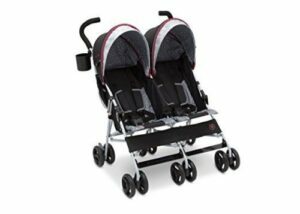 The front wheels swivel 360 degrees to allow for smooth and easy turns even with two growing toddlers. There are net bags for storage rather than a basket underneath the stroller. It is very lightweight and folds to a nice compact size, making it easy to take on an airplane or in the car. If you are looking for a stroller to use at busy events, trips to the fair or similar, this is the perfect stroller. Despite the size, it can easily hold two large toddlers. However, if you are shopping for young babies this stroller isn’t ideal. There is a lap belt, rather than a 5-point harness, and the seats don’t recline, meaning it is better suited to toddlers rather than infants. This stylish and comfortable twin umbrella stroller is suitable for infants and toddlers from birth right up to 45 pounds. The stroller can fit through standard doorways and weighs around 25 pounds, making it great for getting out and about. The way this stroller fold is great for busy parents with active children. It can be folded using one hand, and stands by itself when folded, leaving you free to keep a hold of your children. There are loads of features to ensure both parents and children are comfortable when using this stroller. There is a suspension on the front wheels, which are also able to swivel or lock, depending on which terrain you are pushing on. The footrests and seats offer multiple positions, to ensure your children are comfortable as they grow. There is also a cup holder for parents and a large storage basket which is easily accessible, to make going out with your two kids a little easier. This Chicco side-by-side stroller is suitable for babies older than 6 months and weighing under 40 pounds each. Your kids will be comfortable in the seats which offer 4 recline positions, independently of each other. The leg support also adjusts as your child grows. Your babies will be comfortable in all weathers in this stroller – the rear canopy panels zip off to allow air to flow through. They also adjust independently, so both kids will be comfortable and shaded no matter what. The front wheels offer suspension, as well as locking swivels. Parents will love the carry handle for when the stroller is folded, which allows for it to be lifted and carried easily. 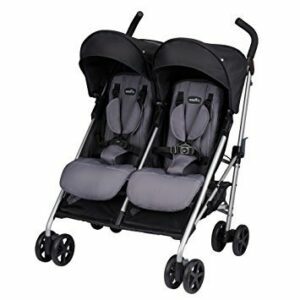 This stylish, lightweight twin stroller is great for those looking for a great-looking, practical stroller on a budget. It can fit through 30-inch wide doorways and offers a compact umbrella fold, making it great for traveling. The stroller offers a parent cup holder and two hanging storage bags behind the seats, perfect for storing everything you need on a day out with two kids. It can hold up to 35 pounds in each seat but isn’t recommended for newborns as it features a 3-point harness rather than a 5-point one. The seats don’t recline either, making it better suited to older babies and toddlers. This is a great-value lightweight stroller which is perfect for traveling. It offers many convenient features, all at a budget price. There is a 5-point safety harness, and two canopies to keep your children safe and comfortable. The front wheels feature shock absorbers, and the seat reclines into multiple positions so your kids are sure to have a smooth ride. 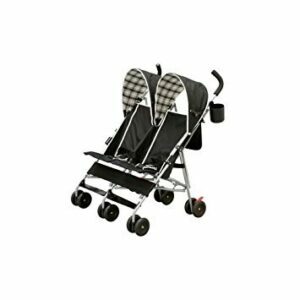 Parents will love the cup holder and large storage bags on this tandem stroller. It is large enough for two tall toddlers to ride comfortably, yet can still fit through a standard doorway. The stroller comes in a range of colors, so you’re sure to find something to suit you and your children’s tastes. 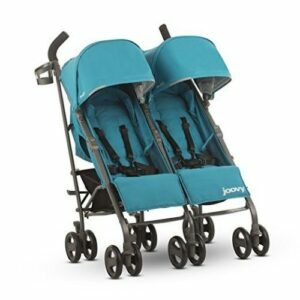 JOOVY’s Twin Groove is the perfect choice for parents looking for an umbrella stroller for their twins. It is the only stroller you will ever need from birth right up until they no longer need to use a stroller. It looks great and offers babies and toddlers of all sizes a smooth and comfortable ride. There are parent-friendly features too, such as the large carry strap, cup holders and carry bags. The stroller is relatively light, meaning almost anyone can handle it with ease. 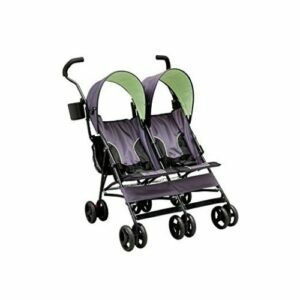 The Kolkraft Cloud is one of the best dual strollers at its price point on the market today. As well as looking great, it has loads of practical features for parents and children. The roll-up seat backs are a nice added feature, making this stroller perfect for those in areas where the summer can get very hot. The stroller is compact and light, at around 20 pounds, meaning it is great for getting in and out of the car trunk.